A great image of the officer’s mess of Company B, 40th Indiana. Taken in the field at an unknown date, they seem to be enjoying dinner. Names in the image are Adjutant William Griswold; Capt. Orpheus C. Harvey and Lt. Albert Olinger. The man with the bottle to his mouth has no rank insignia that can be seen. The servant is unfortunately unidentified also. 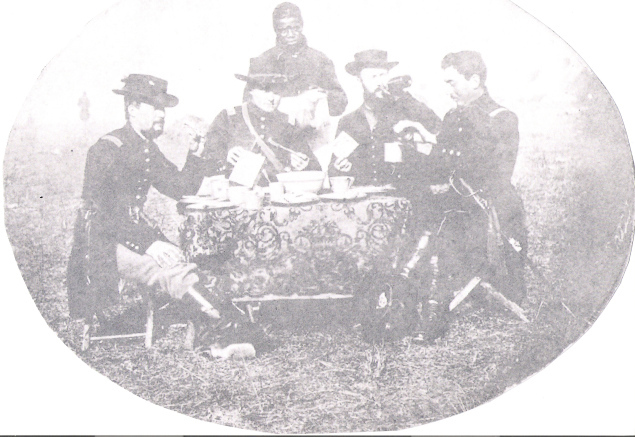 Lt. Olinger resigned February 24, 1864; this dates the image sometime before that date. This entry was posted on January 21, 2009 at 4:31 pm and is filed under Poke Bag, Regimental History with tags 40th Indiana Company B, Griswold, Harvey, Olinger. You can follow any responses to this entry through the RSS 2.0 feed. You can leave a response, or trackback from your own site. Actually I found this very photograph in an envelope at my grandfather, Ned Aitchison’s home, titled on the front “personal effects of Robert Aitchison killed December 31st 1862 at Stones River, TN”. And yes the officers and orderly are all identified on the back just as mentioned in the caption. Also included in the envelope was an old frame, a lock of Robert Aitchison’s hair, a letter written days before the battle and a photograph of Robert in his uniform. So perhaps this photograph was taken prior to December 1862?